Solution: The cue ball A is given an initial velocity V(A1)=5 m/s. If it makes a direct collision with ball B (e=0.8), determine the velocity of B and the angle theta just after it rebounds from the cushion at C (e=.6). Each ball has a mass of 0.4 kg. Neglect the size of each ball. 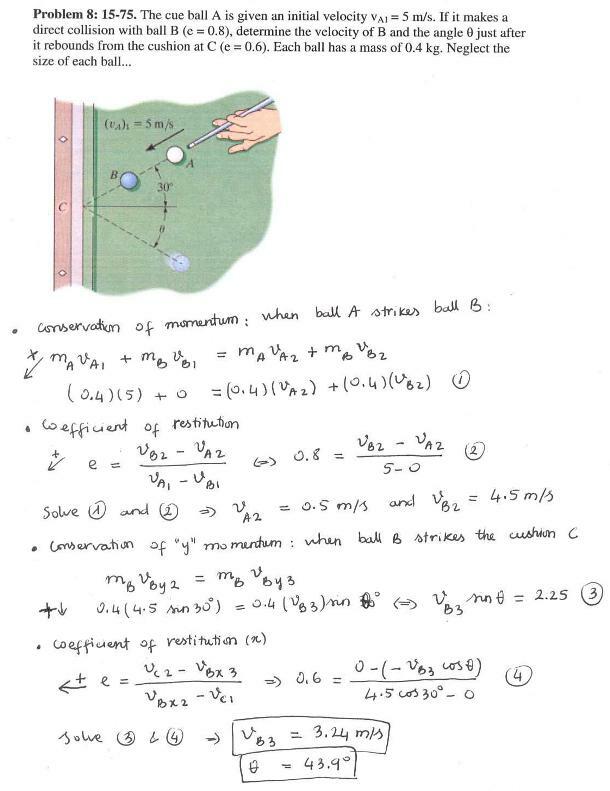 The cue ball A is given an initial velocity V(A1)=5 m/s. If it makes a direct collision with ball B (e=0.8), determine the velocity of B and the angle theta just after it rebounds from the cushion at C (e=.6). Each ball has a mass of 0.4 kg. Neglect the size of each ball.